Your A/C unit does not work with a thermostat alone to cool your home. Another vital factor that you need to consider is choosing your HVAC fan setting. With the right fan setting, you can enjoy a more comfortable home with significant energy savings. For homeowners who are not completely aware of how their HVAC system works, it is important to know the proper fan setting for optimal comfort and savings at home. Here is some advice from A-1 Heat and Air Conditioning – your reliable HVAC company. Majority of air conditioning units have two settings for the fan. For auto, the air only circulates when your air conditioner is in its cooling cycle. Meanwhile, turning it on all day means that the fan will constantly run and distribute the air throughout the house regardless if the A/C is in cooling mode or not. Either of these two settings provides good reasons that can suit your personal comfort needs and preferences. The automatic fan setting helps cut back your energy usage. Plus, you can easily turn it off if the unit is not working well. The auto setting gives the fan a break, making it run longer for extended periods. The only problem with a fully automatic fan is that the indoor air becomes noticeably stagnant when it is not running, tolerating the build-up of dust, dirt, and other air contaminants. Once you switch on the fan, it will blow continuously, filtering your indoor air at all times. This setting is the best fit for people especially those sensitive to allergies, severe respiratory issues, and other health problems. But, you have to be diligent in replacing your air filters as dust can clog it over time. The downside of turning your fan on for long periods is that your energy bills can get higher, and you probably would need to replace the fan motor more often. Would you choose to keep your ventilation system running for quality indoor air or get significant savings on energy? It is up to you! You may also look for other options where you can take advantage of both settings without sacrificing energy savings and indoor comfort. 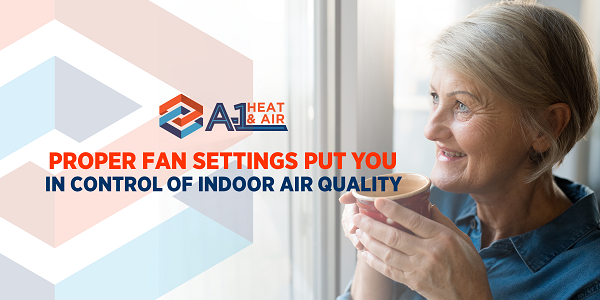 If you are having a hard time deciding which fan setting to choose, A-1 Heat and Air Conditioning is here to help. Call us now to get the proper fan setup.